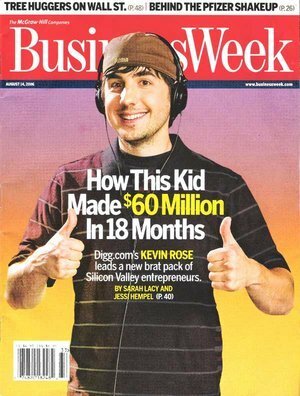 Kevin Rose, ex-CEO of Digg, recently made a strategic decision to radically revamp the way his company operates. In the face of fierce competition, he felt it was necessary to not rest on his laurels and take a risk. His risk failed. It failed miserably. His risk was that he changed the fundamental way that Digg operated - maybe that was the problem, not sticking to your core. But, who knows… had he have not taken the risk, Reddit may have continued to gain traffic while Digg steadily would continue to lose traffic. The new site has some bugs. In one particular week, the new site contained all of its homepage links to it’s rival Reddit! Needless to say, Users are angry. is that it might not work out. The problem with not putting it all on the line is that it will never (ever) change things for the better. Not much of a choice, I think. No risk, no art. No art, no reward. Unfortunately, you can fail with risk. But fortunately, you can win with risk. That’s what matters. Taking risk will make you go places. Taking risk will help you to achieve your dreams.